A reader asked for my report on TryMe, a new dating service for frustrated hipsters in San Francisco. I showed up at Try Me eager to feel the vibe of a new kind of singles’ event. 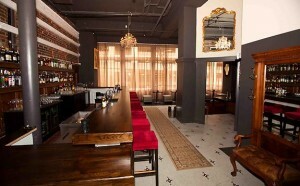 On the plus side, the bar at the Burritt Room was gorgeous. On the negative side, drinks were not free and not cheap. On the plus side again, an organizer introduced me to a cute guy who was fun and genuine and we talked for quite a while. I didn’t have the full, ADD experience of Try Me because I actually spoke to only about five people and two of them for most of the time. Others told me the event had a frenetic feeling as they “tried out” one person after the next. The organizers announced at one point that we were the “creme de la creme” of the single people in San Francisco. Later I rushed back in the bar because I had forgotten my credit card and the cute bartender asked me if I thought the speech was a little fascist. He said the crowd got more animated after they were told they were the best of the best of single people in San Francisco. I told him that flattery will get you anywhere. We agreed on this point. Overall I was positive on TryMe just because it was nice to go somewhere where it’s assumed that people are available and interested in dating. In the future I thought that TryMe should drop the marketing message that their invitees are the most desirable single people because it’s a little creepy and snobby and instead just say that everyone was invited for a reason. A few people told me they were stressed out by all the rapid meeting and greeting. To lessen the pressure, I would suggest adding in a few whimsical games. Games can go a long way in creating a fun, less-pressure filled environment. Thanks for this TryMe report. Another question about it — Did the experience confirm your thesis (or sixth sense); is this a trend to replace regular on-line dating like OKC? Your report was intriguing. I went as far as the TryMe site. And then I froze at the part where they ask for a photo.